The Food & Drug Administration (FDA) has approved a new treatment for the respiratory condition called Chronic Obstructive Pulmonary Disease (COPD). According to the FDA, patients who suffer from this often deadly ailment now have a new tool with which to treat symptoms. The medication is delivered via inhaler, with a spray called Striverdi Respimat and the active ingredient known as olodaterol. It is believed that the drug works by relaxing the airway muscles in the lungs. The drug is often prescribed to be taken once a day, and can be used over a prolonged period of time. Sufferers of COPD (Chronic Obstructive Pulmonary Disease) seek to promote awareness of this chronic respiratory condition during the month of November. 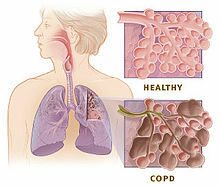 COPD encompasses bronchitis, emphysema, and other lung diseases. Symptoms include chronic cough, shortness of breath and fatigue. COPD is characterized as obstructed airway through the lungs. This inflammation usually will worsen over time. COPD is also the third leading cause of death in this country. The Social Security Administration (SSA) disability program recognizes COPD as a disability. To qualify, you must have a diagnosis of COPD. Further, a lung function test performed by a qualified doctor must show a very limited airway However, proving that one’s condition meets the SSA requirements for the condition can be an uphill battle. The SSA requires rigorous tests, often conducted by SSA doctors, to determine if a COPD patient meets the breathing capacity and exertion ability set out for disability standards. If you do meet the listing requirements for this disease, then you may automatically qualify for benefits. However, those who do not meet the listing requirements may still be able to prove that with their condition, they are unable to work. If your functional capacity reduces your ability to a desk job, and given your age, education and past work experience, you cannot perform a desk job, then you may still qualify for disability benefits.